Living life in a big way seems to be Amanda’s life journey. Not content with just dancing, she is a stage manager, a volunteer organizer, a belly dance teacher and a costumer. She has danced with Thia for 12 years and has been a member of Wysteria for 11 years. Amanda has been married for 17 years, manages a game store with her husband, and has a 27-pound cat named Paws. Through this interview, I discovered a woman of immense energy and drive, a great sense of humor, a loyal and devoted friend and a dancer who truly wants the very best for Utah’s belly dance community. When Amanda pinched a disc at work 12 years ago, she discovered that the exercises for her back were the same as belly dancing movements – body waves, figure-eights and mayas. Belly dancing seemed more fun and has become her life’s hobby. “I thought I was too big. I knew I wouldn’t be able to dance in front of an audience. I told Thia that I would take the classes, but she would never get me on stage. Ha! Now you can’t get me off the stage!” Amanda said. Amanda’s tribal style has been influenced and inspired by Fat Chance Belly Dance and Rachel Brice, but it is Thia who is her foundation. Thia has first and foremost been her guiding inspiration in dance. It is Thia who gave her an opportunity to become a stage manager, to organize volunteers for her Belly Dance Spring Fest, and to teach at her dance studio. Thia has acknowledged Amanda many times as her “right hand goddess.” These experiences have given Amanda a perspective from many angles regarding belly dancing and our community. “When I can’t dance anymore,” she laughs, “I’m going to write a book! Recently, I have been surprised to see many of our dancers move out of their boxes. We are sharing ideas, choreography and the creative process. I see the dancers in Utah really stretching themselves in new ways. It is wonderful.” Amanda said. 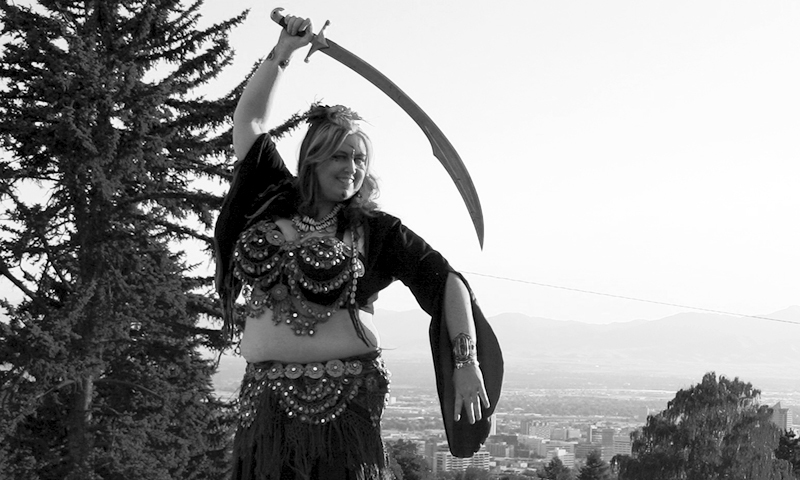 Utah’s belly dance community survives and thrives because of the voluntary efforts of people like Amanda. The “behind the scenes” people, who make all the dancers look beautiful, get on stage, and dance to the right music, are never acknowledged enough. I give a standing ovation and applause to Amanda and everyone else that keeps our art form alive, healthy and fun! Amanda will be performing with Wysteria and Nenephta at the Belly Dance Spring Fest, March 3, Utah State Faire Grounds. Go to www.bellydancingbythia.com for more Spring Fest information.